This picturesque settlement built of mellow stone, is one of the loveliest and best preserved of all the Cotswold market towns. Little has changed here since Queen Elizabeth I sat on the throne (1533 – 1603). The term 'chipping' is an old medieval phrase meaning a market or centre of trade. 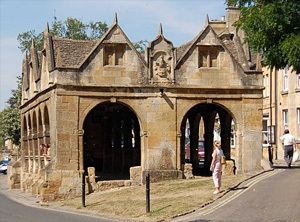 During the medieval period Chipping Campden was a prosperous wool town. Back when Cotswold wool was England's main export and source of the country's riches, making Chipping Campden one of the most important of all the medieval towns in the Cotswolds. The centre of the town is full of history and character, with many fine 14th to 17th century stone houses. The elegant Market Square is located in the middle of a broad tree-lined High Street. Buildings of note here include the fine 19th-c Town Hall and the much older Jacobean Market Hall of 1627. With its broad sheltering bays and sturdy support pillars, the Market Hall is one of the most iconic structures in the Cotswolds. Built by a rich London Merchant Sir Baptist Hicks. The hall is now owned and maintained by the National Trust, who saved it from export to the USA in 1942. The High Street has good selection of old Coaching Inns, restaurants and shops, all built of mellow Cotswold stone with steeply pitched Gables, tall chimneys and mullion windows. Old fashioned sundials are a feature on several of the more architectural buildings here. Other important buildings in the town include the Woolstaplers Hall, Grevel House and the fine Medieval wool church of St James. The Woolstaplers Hall is a 14th-c stone building in which wool merchants once graded the fleeces of Cotswold Sheep. It has a fine timber roof and a stone fireplace bearing the arms of Robert Calf, the rich merchant who built it. The oldest house in town as is the Gothic Grevel House, erected at the end of the 14th century by the wool merchant William Grevel. The town's magnificent medieval church, dedicated to St James, was also built by Grevel. It is one of the finest wool churches in the Cotswolds, with a magnificent tower and spacious interior. It has fine stained glass, several medieval relics and a number elaborate marble tombs, such as the Hicks Monument, carved in commemoration of Sir Baptist Hicks (Lord Campden) and his wife Elizabeth. The beautiful Arms houses near the church were build by Sir Baptist Hicks in 1612. It is a stone masons' masterpiece of assorted stonework cut by hand to fit exactly together without the need for mortar. A comprehensive provision of hotels, guest houses and traditional inns are available around the town, making Chipping Campden an ideal centre for exploring the Cotswolds and south midlands area. The annual 'Cotswolds Olimpicks' (sic) are held on nearby Dovers Hill. This friendly local competition comprises a bizarre mix of sports, games and local festivities, dating back to the 17th century. This award winning museum of craft and design displays the works of C. R. Ashbee and his Guild of Handicrafts, plus the work of many other local craftsmen. The gardens opened in 1984 to commemorate this distinguished plant collector, who was born in Chipping Campden in 1876. Known locally as Chinese Wilson, he explored China and many other Far East countries, in search of plants and seeds to send back to the UK. He succeeded in introducing no fewer than 1200 plant species, many of which are represented in the gardens, including the Paperbark Maple and the Handkerchief Tree (Lilium regale), for which he is best remembered.